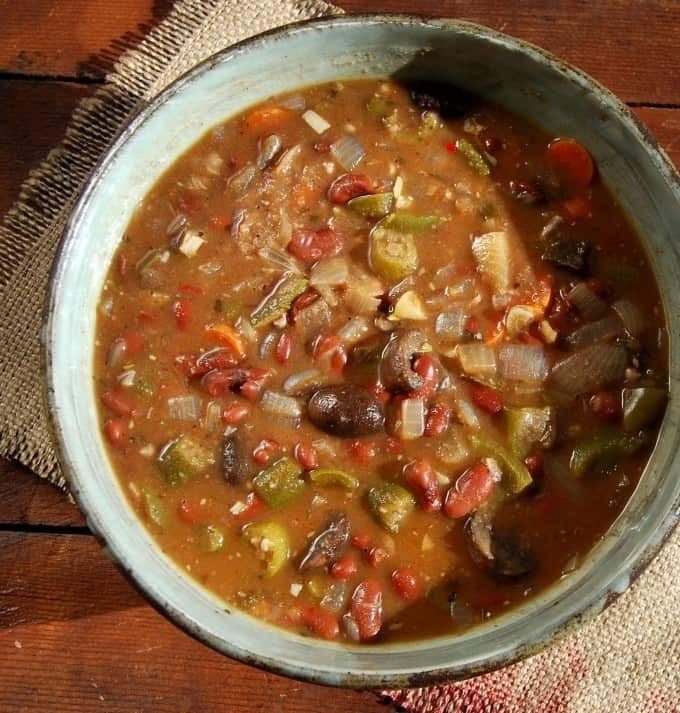 This delicious, gluten-free vegan gumbo has no added fats, and it is packed with delicious beans, okra, mushrooms, thyme and sage. Serve with brown rice for a tasty and healthy meal. A soy-free recipe. When I was a child, a young woman with a huge straw basket balanced over her head would make the rounds of my neighborhood every week or so. She would knock on doors, peddling fresh fish that her husband had just hauled in that morning from the sea that hugs Bombay’s shoreline. Everyone simply called her “Kolin” which is the Marathi word for fisherwoman. Kolin was a striking woman– mahogany skinned with large eyes shaped like almonds and gold earrings so big and so heavy, they had pulled her earlobes almost down to her chin. She was always dressed in a colorful saree with a gold border and at her waist, where the saree tucked in, she had fashioned a little purse with the fabric in which she kept all the bills and coins she had collected from her customers. I dreaded Kolin’s visits. Partly because of her rather abrasive tongue that always told you exactly what she thought, and partly because I hated the smell of the fish that lingered in the air for hours after she had left. But I was never so terrified as the occasional day when Kolin would bring what my parents considered a special treat: crabs. The little creatures would be alive as Kolin picked them out of a wire cage in her basket, snapped their claws and put them in a steel tin my mother would hold out. Some would escape and run all over the apartment, scurrying into every corner of the room, trying to hide from the inevitable. It was such a terrifying sight that I could never bring myself to eat a crab through all of my childhood. Years later, a friend who loves her seafood argued with me that crabs do not really feel pain or fear death: they just don’t have the mental capacity to do it, she insisted. But it is not an argument that is easily made to someone who had seen the terror of those little crabs in a Bombay apartment trying to save their skins. According to the Humane Society of the United States, lobsters, crabs, and other crustaceans are complex creatures who can remember things they learn. Crustaceans feel pain and may not immediately die when one part of their body is destroyed, which may mean they experience prolonged suffering before dying. It is not just the creatures we eat that suffer and die. Driving home the other day, I was listening to a segment on NPR’s All Things Considered that reminded me of another reason why seafood is just not a good idea. The report discussed the massive numbers of mammals that are injured or die globally each year in fishing “incidents” — around 650,000. Casualties happen in all sorts of fisheries, ranging from tuna to squid, shrimp, swordfish and bottom-dwelling fish. At the bottom of the ocean, sea mammals can get trapped in trawls. The mammals affected include dolphins, whales, seals, porpoises, manatees and so on. And now for the vegan gumbo! As nature turned the world into a cold, icy mush over this past week, I found myself craving for something warm and comforting and nutritious to put into my tummy. It seemed the perfect time to stir up a seafood-free vegan gumbo — something I’d been planning on making for a long time. One of the things I love about eating vegan is that I never have to be one of those people who has to rush at the last minute to buy milk or eggs because a storm is coming and the supermarket may not be open or accessible for days afterward. I don’t have to worry about a power failure turning all that meat in my freezer into an unsanitary nightmare. Give me some beans, rice, frozen veggies and soymilk — all of which are usually already in my pantry — and I’m all set. I had everything I needed for the vegetarian gumbo on hand. Okra, beans, onions, green peppers, herbs, and even some Cajun seasoning that I had picked up months ago. And then, just to get a little edgier, I decided to make my vegan gumbo fat-free. There seemed to be so much going in with all those different flavors — beans, herbs, veggies– that the fat just seemed totally redundant. I threw in some sage and chipotle for their smoky deliciousness, and I made the gumbo gluten-free by making the roux with brown rice flour instead of whole-wheat– an idea that totally worked. The recipe’s really easy and comes together faster than you would imagine. I served it with some wholesome brown rice, but crusty bread or quinoa would go really well with this too. Wishing everyone a great weekend– hope you have plenty of time to live, love, and laze around, not in any particular order. 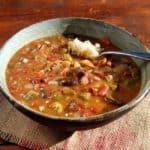 Now on to this gluten-free and fat-free vegan gumbo recipe — it’s going to take you straight into New Orleans! 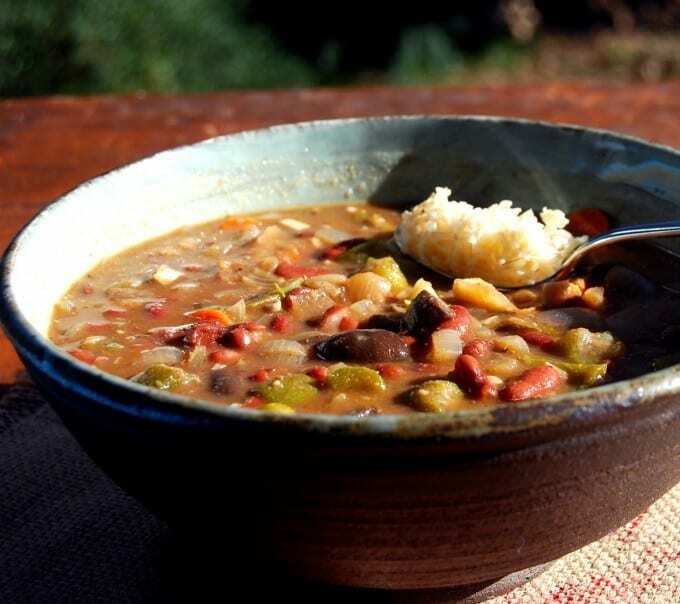 This delicious, gluten-free vegan gumbo has no added fats, and it is packed with delicious beans, okra, mushrooms, thyme and sage. Serve with some brown-rice for a tasty and healthy meal. 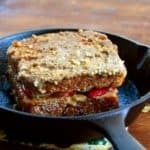 Soy-free, nut-free recipe. 3 cups of canned red beans,, If using dry beans, start with 1 cup of beans, soak them overnight, then cook in a pot with enough water to cover the beans. Let the water come to a boil, lower the heat to simmer, cover the pot and then cook about 90 minutes to 2 hours, until the beans are tender. Add more water if the beans get dry., drained and rinsed. Heat a large pot and add the brown rice flour. Roast, stirring constantly over medium-low heat, until the roux is a couple of shades darker. Remove immediately to a bowl. In the same pot, add the onions, carrots and garlic along with a quarter cup of water or vegetable stock. Season with salt and pepper. Cook, stirring frequently, until the onions soften and the water has evaporated. 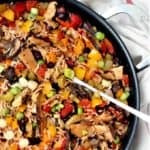 Add the tomatoes, bell peppers and mushrooms and cook, stirring, for another five minutes. Add the chipotle chili and adobo sauce, tamari, herbs and the Cajun seasoning and mix well. Now add the beans and the okra and stir well to mix. Add the brown rice flour back to the pot and stir in. Add 2 cups of vegetable stock and allow the gumbo to come to a boil over medium-high heat. If the gumbo is too thick, add more water or stock. Lower the heat to a simmer and let everything cook for another 10 minutes. Add more salt if needed. Turn off the heat. You can also throw in some vegan sausage if you like -- cut it into rounds. That would add a small amount of fat to the gumbo, but it would also send the protein content soaring higher. That looks so yummy – I’m going to be making that in the next few days for sure. I have some vegan chorizo that will probably end up in there; my 46 year old son lives with me and doesn’t feel satisfied without some on his plate or in his bowl. Which brand of Cajun seasoning did you use. Did I miss where you add the brown rice flour back to the pot? I saw toasting it and removing it, but not using it as a thickener. Hi Jacqui, you add it back just before you add the stock. It’s in the recipe now. Thanks. this looks so good! I have never tasted gumbo, do you eat it with anything? Do you add okra, just like that? will it not make the stew slimy? Hi Pallavi, you can eat it with brown rice or quinoa or bread even. The okra does not at all become slimy in this, because of all the liquid. It actually helps as a thickening agent. Mmm … this looks delicious!! In my pre-vegan days, I loved shrimp gumbo and frankly, I’ve never found a vegan version that lived up to the original. I think that this one will do it with all the lovely vegetables and flavorful “gravy”. Browning the flour will give it that authentic taste, as will the okra. Thank you for including information on how many dried beans to use. I prefer to pressure cook my beans … it’s so fast and easy and we get so many more meals from a package of dried beans versus cans. But I’m never quite sure how many to cook to equal the beans in a recipe. Can’t wait to try this! I noticed you had mentioned after the amount of red beans to use, ‘…to put enough water to cover the lentils…’ Did you mean the ‘red beabs’, as I didn’t notice lentils as one of the ingredients. My husband loves okra and was a big ‘seafood gumbo’ connoisseur, but due to health issues, we have had him on intake of vegan recipes & juicing. 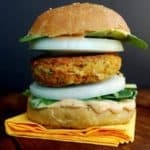 This looks very easy, and delicious, to prepare! I am cooking it right now, both kid and I cannot wait to taste our first gumbo ever. What is adobo sauce? I did not see it explained in the Vegan Gumbo recipe. You can buy chipotle chilies in adobo sauce at any supermarket– it’s usually sold in a tiny can in the international foods aisle. You can store the leftover chilies and their sauce in an airtight box in the refrigerator. The adobo sauce is very flavorful but it’s also very spicy, so use it with caution. First, I want you to know that I very rarely leave reviews. Maybe I am just lazy, who knows, but what I am about to tell you is very genuine and from the heart. 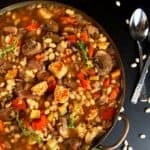 I got online, searching for healthy vegan gumbo recipes as I, too, was craving some comforting, healthy soup and gumbo, I knew, would hit the spot. 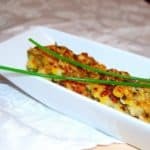 I traveled amidst a sea of different recipes, but this one caught my eye. And then, I read your blog post about the fisherwoman, or Kolin, and I had chills. I love that you took the time to stress the importance of “can’t feel pain” arguments and tie it into your own experience. I have never eaten a crab in my life, to know that they are living, sentient beings has been enough, but your words were quite powerful and so touching that I found myself not only in chills, but copying/pasting this link to my Facebook, along with an excerpt from your blog in hopes that it would touch others the way that it did me. I have since bookmarked your blog and I will be back, indeed. I’m going to make this tomorrow for our neighborhood Mardi Gras parade! 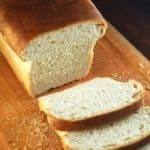 Can I use whole wheat flour instead of brown rice flour? Thanks! Hi Carissa, yes, absolutely. Roast it the same way. Cheers. Wow! This is really good! Thanks! I am not vegetarian but I am from the gulf coast (alas, live much further north now) and have many vegan/veg friends. 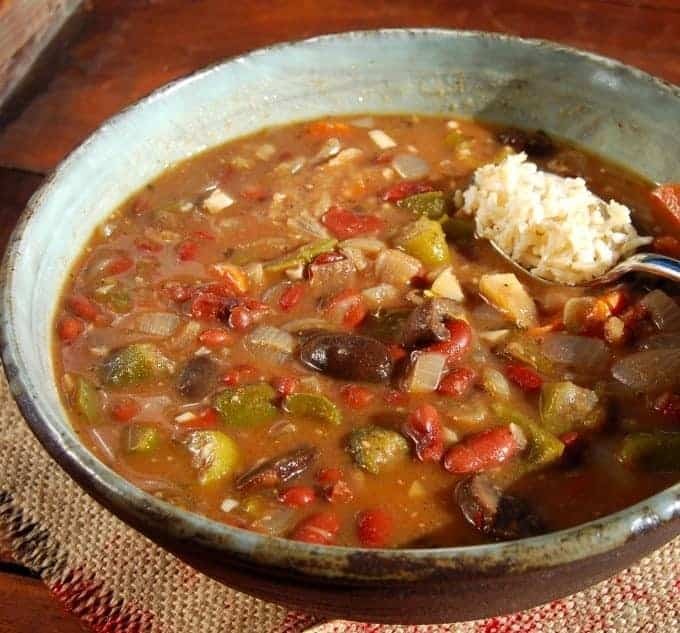 As this time of year always makes me nostalgic, I am having a Mardi Gras dinner and find myself taking elements of your recipe with my own seafood gumbo for my diverse group. I have to say- your spices and the adobo are fantastic and I can’t wait to serve this on Mardi Gras night! Laissez Les Bons temps rouler! I don’t eat seafood for the same reasons. Your words summed up nicely my feelings. I also believe there are healthier choices for omega’s in the plant kingdom. This looks and sounds wonderful and I will be making this soon. 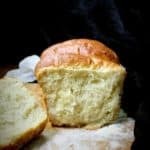 Thank you for sharing your recipe and your story. I have actually made this several times and it always comes out great! 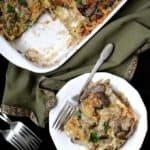 It’s a great way to get veggies in and I love it with garlic bread. 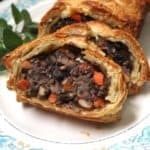 I’d like to try it with some vegan sausage, but I haven’t been able to get it out of the package and cut it into rounds: it crumbles so easily. Do you have any tips on how to do this easily? Hi Krithika, I usually use the Field Roast ones– I take a pair of scissors and snip off the top, then run the scissors down the side of the plastic casing. Then I just peel it off. It always works for me. Glad you like the recipe! 🙂 Thanks for letting me know. Hi Tara, yes, this is fat-free, so no need to add butter or oil. Cheers! 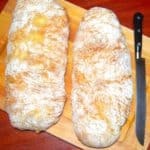 I think this would be really great with some smoked salt! It’s one of my favorite ingredients for veg dishes, without having to reach for the bacon or sausage that my grandma used to flavor things. Applewood is good for most dishes, but sometimes hickory is better; usually for breakfast foods. I made this gumbo and it deelish!!! It came out wonderful! I made this with some fresh CSA okra because you know nothing screams gumbo like 90 degree weather. It was amazing! You don’t even miss the oil at all with all the other flavors. I will totally be making this one again. Made this like eh 2 weeks ago I believe and it was soooo gooood and very flavorful. The aroma was amazing as well and I just knew it’d taste good before tasting it haha. Omg it’s going to be a staple of mines now. Going to be making it again soon. Can’t waait. You’re a genius c: thank you very much. I ate it w/ rice so it could be more filling. Also what’s the serving size? Like a cup? I’m very excited to try this, and I bought all of the ingredients, but I bought the wrong peppers. I bought the plastic bag toasted jalapeños. Would those work, or should I go back for the canned peppers in adobo? I’m happy this is fat free! P.S. There is a vegan Cajun place that just opened here called Krimsey’s! I tried it and I was so delicious! The flavors are different but now that you have the jalapeños, just use those. Should taste good. Awesome, so happy you tried it! Hi, just wondering how spicey this is as I have toddlers. They can tolerate a bit of a kick.😉 This looks great and I will post a review after I’ve made it! My husband is always on the lookout for different vegan recipes to try and was excited to find your website. He made the gumbo last weekend and it turned out really delicious. Was enjoyed by all. Used bbq spice mix as we didn’t have the Cajun spice and it gave a lovely smoky flavour. I’m from Louisiana with a long family history of traditional gumbo. 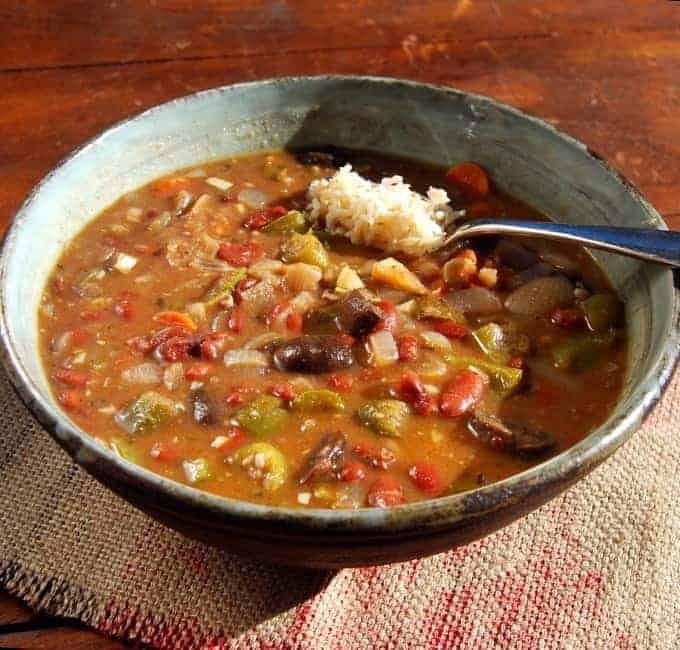 I’ve tried a few different vegan gumbo recipes, but this was by far the BEST! It will be a regular in our home. Thank you! I made this tonight and it was fantastic, and beautiful! Thanks so much for another great recipe I can enjoy with dietary restrictions. The report discussed the massive numbers of mammals that are injured or die globally each year in fishing “incidents” — around 650,000. Casualties happen in all sorts of fisheries, ranging from tuna to squid, shrimp, swordfish and bottom-dwelling fish. At the bottom of the ocean, sea mammals can get trapped in trawls. The mammals affected include dolphins, whales, seals, porpoises, manatees and so on. I hate to burst your bubble but do you know about the massive numbers of mammals that die during the harvesting of the beans and grains that you eat? “No food is free of death. Being a vegan doesn’t mean you get to say no creature was harmed because of the way I eat” it’s simply not true. That said – your recipe is really nice and I’m going to use it as a veggie offering at my New Year’s Day party – along side a traditional gumbo. Hi Cathy, sure, no food production is without casualty, and I daresay every vegan knows that, because we don’t just embrace this cause instinctively or emotionally — for most of us it’s a journey reached through realization, compassion and research. This is also a popular card for meat-eaters to pull out when they argue against veganism. That said, vegans still cause far fewer casualties than meat-eaters do, by not contributing directly to animal cruelty and suffering in food production, including the nine billion chickens, 121 million pigs and 30 million cows who die horribly to feed Americans each year.